It was decided after Canon K.M.Bishop left that a permanent reminder of our past clergy should be displayed for all to see. In Norman times Deane was part of the even more ancient parish of Eccles, and the Church here was called 'Saynte Mariden'. It was a Chapel of the mother church at Eccles, and was serviced by the clergy of Eccles. 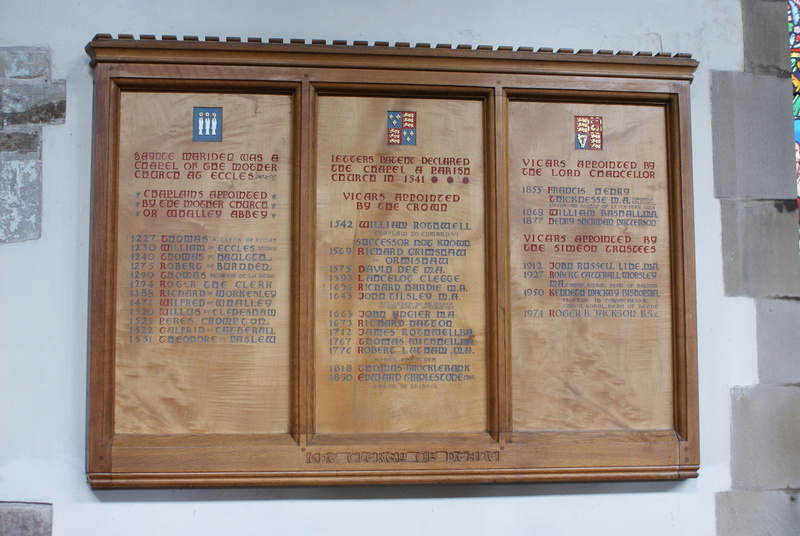 Notice the first two names on the board are Thomas, Clerk of Eccles and William de Eccles. The earliest records date back to 1220. In the later part of the 13th century Deane was given to the Cistercian Monks at Stanton (Stanlow) in Cheshire (near to where the present day oil refinery is situated). When they subsequently moved to Whalley near Blackburn and built Whalley Abbey then Saynte Mariden became more closely associated with Whalley Abbey. This can be seen reflected in the names of the clergy e.g. William de Whalley. It is thought that these clergy from the Abbey would probably have been accommodated in the tower and that the small opening in the tower (just below the present roof) was a window from which the priest or sacristan could keep a watch to guard the church's treasures.